Bubba was a stray kitty who had been hanging out around the home of one of our clients. She intended to have him neutered and then find a rescue willing to find him a new home but when Bubba turned out to be FIV positive his options became limited. We decided we needed to try and help him. Although Bubba has FIV there is no reason he can’t live a long enjoyable life. He likes curling up in a warm bed and he loves getting attention. 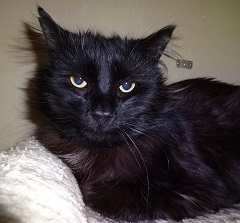 He can be a little nervous at first so he would probably do better in a quieter home without small children. If you think you might be able to give this guy a second chance at life please talk to one of our staff for an adoption application.